Mercury Is Spotted For The First Time – From Mars! NASA’s Curiosity rover may be busy exploring the rugged and rocky interior of Gale Crater but it does get a chance to skygaze on occasion. And while looking at the Sun on June 3, 2014 (mission Sol 649) the rover’s Mastcam spotted another member of our Solar System: tiny Mercury, flitting across the Sun’s face. 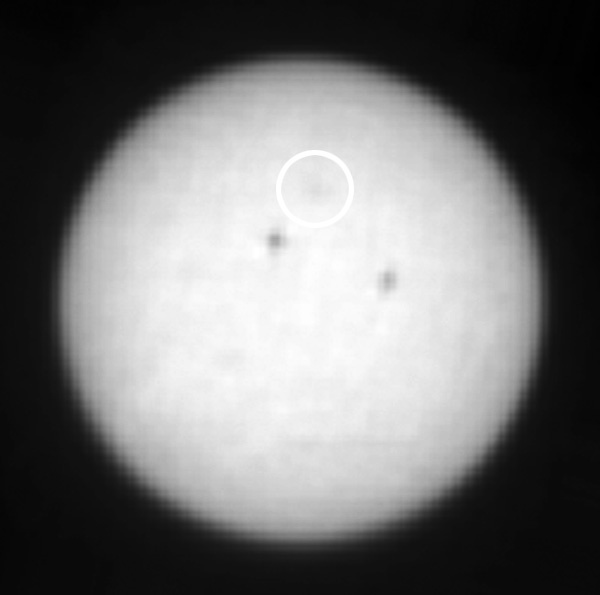 Silhouetted against the bright disk of the Sun, Mercury barely appears as a hazy blur in the filtered Mastcam image above. But it was moving relatively quickly during the transit and passed the darker smudges of two Earth-sized sunspots over the course of several hours. It was the first time Mercury has ever been imaged from Mars, and also the first time we’ve observed a planet transiting our Sun from another world besides our own. Read the rest of my article (and watch a cool animation of the transit) on Universe Today here. Next Post Happy First Year on Mars, Curiosity! Another exploit of our ” small robot ” on Mars, great !! Question: Amazing timing coincidence or amazing timing calculation of a predicted event? The latter. They knew this would happen and arranged to capture it on camera.